Overview: A wealthy and popular temple of India, Padmanaswamy Temple with its brilliant Dravidian architecture is dedicated to Lord Padhmanabha (Vishnu). This is one amongst 180 Divya Desams in India which are holiest abodes of Lord Vishnu. The presiding deity in the temple is Lord Vishnu reclining on a hooded serpent, known as Anantha. One of its notable features is the seven-tiered gopuram with a height of 100 foot. 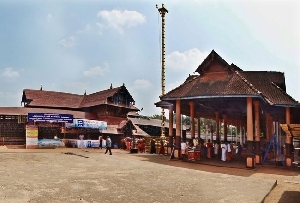 The gopuram was built around 1566 in Pandyan style. Stretching from the eastern sides of the temple the corridor leads to the grand sanctum; corridor’s detailed carvings and sculptures add to the beauty. Idol: Main deity inside Padmanabhaswamy Temple is Lord Vishnu (Lord Padmanabha) reclined on a five-hooded serpent, Anantha. 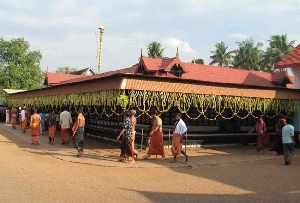 Anantha has spread its hoods above the deity. Five hoods of the serpent represent five senses, Panchedriyas and five elements known as Panchabhootas. The lord has his head positioned to the south and his feet point to north. Three coils are symbolic of characteristics of mankind, namely Sattwa, Rajas and Tamas. Emerging from his navel is a lotus upon which Lord Brahma is seated. Lord Shiva’s lingam is placed below his right arms. The three lords combine to represent Srushti, Stithi and Samharam. There are three doors only through which you can behold the deity and this too has significance as it is symbolic of the three stages of times. 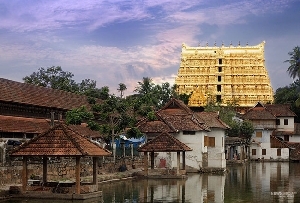 Other idols in Padmanabhaswamy Temple consist of Sree Ramaswamy with his consort Seetha and brother Lekshmanan, Sree Veda Vyasar and Ashwathama, Vishwaksenan, Sree Yoga Narasimha Moorthi, Thiruvambadi Sreekrishnaswamy, Kshethrapaalakan, Agrashaala Ganapathi, Sree Dharma Sastha, Hanuman Swamy, Ashtanaga Garuda Swamy and the Maha Meru Chakram. 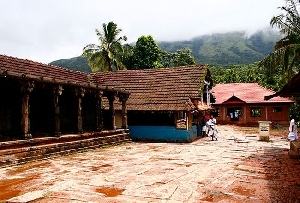 Importance: Padmanabhawamy Temple has its reference in holy texts like Srimad Bhagvat Gita. 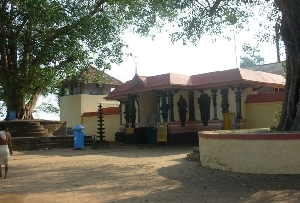 According to Bhagwad Gita, Balarama visited this temple and made offerings after bathing in Padmatheertham. A poet from the 9th century, Nammalwar, composed ten hymns to praise Lord Padmanabha. History: Many historians and writers have stated that this temple was established in the beginning of Kali Yug. If this statement is to be believed, the temple is 5000 years old. However, no reliable documentations have yet been found that tells when and by who the temple was commissioned. Entries are restricted to people following Hindu religion and these people are required to follow a dress code inside. On the old palm leaf records of the temple, another popular legend named ‘Ananthasayana Mahatmya’ is found. It is said that this story was consecrated by Divakara Muni, a staunch follower of Lord Vishnu. According to the story, when Divakar Muni was in deep tapas he saw Lord Vishnu appear in front of him in a form of a child. He requested the child to stay with him but the child put a condition for the same. He said that the saint must be respectable towards him and if he didn’t the child-god will disappear in a minute. Divakar Mani agreed. One day when he was in deep meditation, the child took salagram of the sage and started putting it in his mouth. This made the sage very angry he scolded the child and according to the condition, he disappeared. While going away, the child (Lord Vishnu) instructed the sage to find him in Ananthankaadu. After few days the sage proceeded to find the child. He reached a forest near sea and caught a sight of the child disappearing into Ilappa tree. In a short while, the tree fell to the ground and it assumed Maha Vishnu’s form. Sage offered prayers to the tree and requested if he can condense himself so he can see him. Lord agreed and shrunk into a size thrice the length of the sage’s yoga dand. The sage offered mangoes in a coconut shell. Lord Vishnu ordered that prayers to him must be offered to him by Tula Brahmins like Divakar Muni. 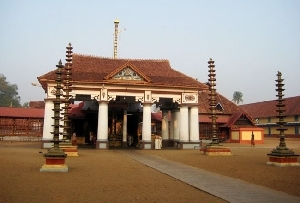 Temple Layout: Padmanabha Swamy Temple is inspired by Dravidian architectural style, with stone and bronze embellishments. Its gopuram has a height of 100 ft. Murals and paintings adorn the interiors. Dhwaja Stambha (flag-post) at the entrance is covered with copper sheets plated with gold and stands 80 ft tall. Bali Peeda Mandapam and Mukha Mandapam are two halls portraying an exquisite structural feature. These halls are decorated with sculptures of Hindu deities. In Navgraha Mandapa has its ceiling decorated with nine planets of the solar system. The corridor, extending from the entrance to the sanctum sanctorum, has its wall carved with granite-sculptures. 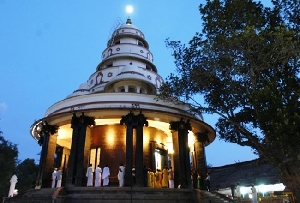 Festivals: Many festivals are hosted in the temple and most of the important ones take place annually. 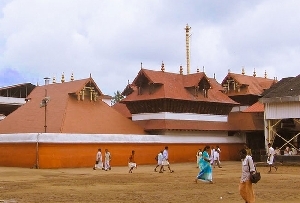 Major festival of Padmanabha Swamy Temple is Navaratri Festival, which lasts for 9 days. During these 9 days the popular Swathi Music Festival is also organized here. 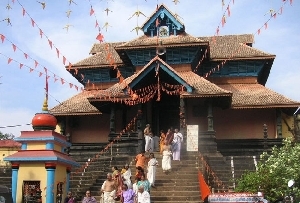 The ground floor below gopuram is called nataka sala which also happens to be the venue of ten-day festival Uthsavam. 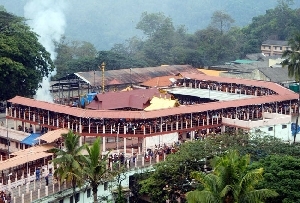 This is a popular festival in Kerala and takes place twice a year. 06:30 am. to 07:00 am. 8.30 am. to 10:00 am. 10:30 am. to 11:10 am. 05:00 pm. to 06:15 pm. 06:45 pm. to 07:20 pm.